NFL owners have approved a policy allowing players to stay in locker room for national anthem, but they must stand if they are on the field. ATLANTA — Browns owner Jimmy Haslam said he wants to get back to strictly football talk. Cowboys owner Jerry Jones wishes the attention returns to the field and not what’s on CNN. Steelers owner Art Rooney hopes to continue back-and-forth dialogue with NFL players. The NFL owners’ desires probably became harder to attain Wednesday after they announced a new national anthem policy that fueled more controversy. The national anthem policy announced by NFL commissioner Roger Goodell at the owners meetings will require players and league personnel on the sideline to stand during “The Star-Spangled Banner,” but gives them the option to remain in the locker room. “It was unfortunate that on-field protests created a false perception among many that thousands of NFL players were unpatriotic,” Goodell said in a statement. “This is not and was never the case. This season, all league and team personnel shall stand and show respect for the flag and the anthem. Personnel who choose not to stand for the anthem may stay in the locker room until after the anthem has been performed. 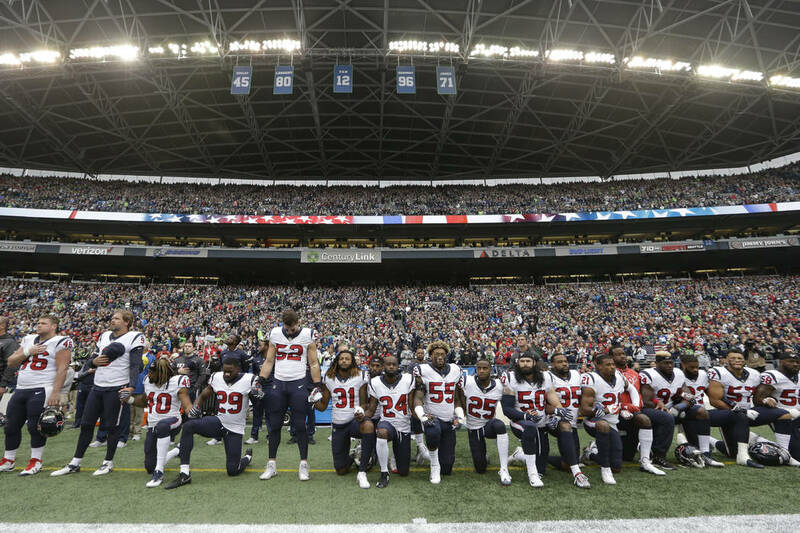 Many players participated in national anthem protests during the 2017 season that led to a firestorm debate for the NFL. The protests started in 2016 when former 49ers quarterback Colin Kaepernick took a knee during the anthem in a sign against police brutality and racial inequities in the justice system. Multiple owners said they considered the viewpoints of the players when agreeing to the new anthem rules, but the NFL Players Association said it will challenge any part of the policy that violates the collective bargaining agreement. In a sign that players were not part of the discussions, any violations of the policy would result in fines against the team — not the players. NFL teams will have the power to set their own policies in the case of a player choosing to kneel on the sideline instead of being in the locker room. This part of the new policy could put teams in a tough position like the Raiders, whose running back, Marshawn Lynch, sat for the anthem nearly all of last season. How would Raiders coach Jon Gruden, who hasn’t coached in the NFL in a decade, react to players going against the league’s anthem rules? Raiders president Marc Badain declined Wednesday to comment on the new policy. The league said the owners voted unanimously for the change, but 49ers owner Jed York revealed he abstained from voting because of the lack of player involvement. It’s unknown if any other owners declined to vote. “We wanted to get to a place where all the different viewpoints could be respected,” Rooney said during the policy news conference. “I think we’ve come out at a place that we as a group in the league are comfortable with. We want to continue to work with our players and make sure that they feel their point of view has been respected. Contact Gilbert Manzano at gmanzano@reviewjournal.com. Follow @GManzano24 on Twitter. The Associated Press contributed to this story.